UPDATED: Sat., June 16, 2018, 7:11 p.m.
Never a doubt, as they say in sports and in life. Five years ago, Sir Washington somehow made it through high school, despite every obstacle life placed in his way. Two years later, he overcame injury and was on the court for Eastern Washington in the NCAA Tournament, and played one of the best games of his career. Never a doubt, because Sir Washington is a player. But Washington also was a Prop 48 athlete, a partial qualifier with some catching up to do in the classroom. The doubts – serious ones – came in the classroom and study hall, while facing a blank sheet of paper on his desk with little idea of how to fill it with words that would satisfy a college professor. However, with help from coaches and Eastern’s academic support staff, Washington was living the dream Saturday afternoon. Two hours later, Washington became the first in his family to graduate from college. The celebration matched the moment, with 20 relatives making the trip from Las Vegas. No one was prouder than his parents, Melvin and Sharon Washington. “Over the years he had some struggles, and I’m very proud to be his father,” said Melvin, a high school basketball star who went on to play college but didn’t graduate. A similar fate loomed for Sir. He was the product of a poor learning environment in depressed North Las Vegas, which has a poverty rate of 18 percent and one of the highest violent-crime rates in the nation, along with chronic homelessness and gang violence. “His grades weren’t great,” said EWU head coach Shantay Legans, who recruited Washington as an assistant for Jim Hayford. “But in talking to his principal and his counselor, they loved the kid. He was always helping people, and walking the teachers to their cars,” Legans said. Washington finished with a 2.0 grade-point average and signed with Eastern as a Prop 48 athlete. “We told Hayford, ‘This guy is going to need a lot of hand-holding,’ ” said Jim Fitzgerald, Assistant Athletic Director for Student Success. “His academic toolbox was short, and he didn’t have the study skills or time management – we had to teach him that,” said Fitzgerald, who credits Study Table Coordinator Earl Overlie for laying the groundwork. “He’s one of the reasons we’ve gone 32 straight quarters above a 3.0 GPA,” said Fitzgerald, speaking of Eastern’s 300-plus student-athletes. Washington did the rest. 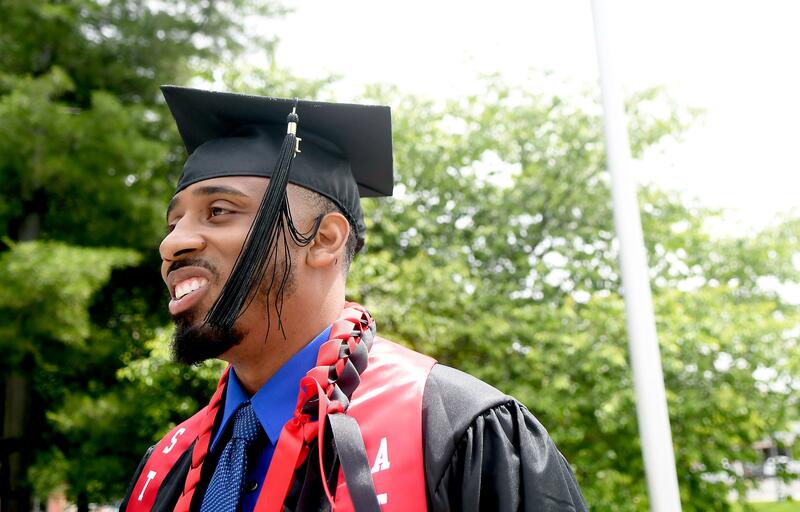 Even as he was forced to sit his first year, Washington continued to work, focusing on school and “making sure I stay on track to graduate,” he said. Arriving in Cheney in the fall of 2013, Washington didn’t know what that meant. That moment, shared by Washington’s parents, brothers and and cousins, was five years in the making, longer if you consider the Eagles’ recruiting efforts to land the talented guard. Legans was there from the beginning, a fact that Washington’s parents appreciated on Saturday. Legans was there too, as was graduating senior Bogdan Bliznyuk, who emigrated from Ukraine and became a star on the court and in the classroom. “I learned a lot from Bogdan,” said Washington, referring to much more than basketball. The table set, Washington did the rest. He’ll graduate with a 3.0 GPA and a degree in communications. Next month he’ll return to Vegas, with an invitation to try out with professional teams from Europe. If that doesn’t work out, Washington will put his degree to work. Published: June 16, 2018, 6:50 p.m. Updated: June 16, 2018, 7:11 p.m.